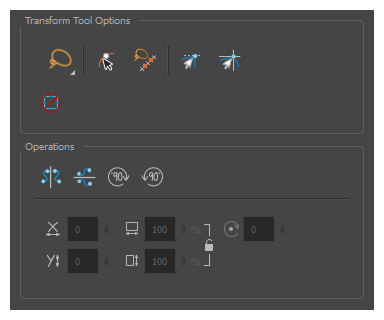 When selecting the Transform tool, several options are available in the Tool Properties view. In the Camera view, the Peg Selection Mode limits the selection to peg layers instead of drawing layers. This mode is useful when you have created a character rig using peg layers for each drawing. That way, you do not accidentally select the drawing layer when you want to animate on the peg. When disabled, the Transform tool selects the drawing layers. When enabled, it is possible to select one or several controls displayed in the Camera by drawing a lasso/marquee around them. 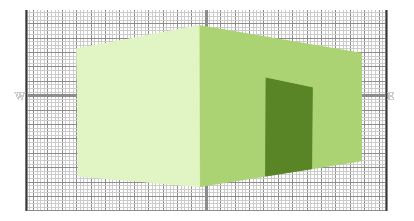 By default, drawing a lasso or marquee with the Transform tool selects layers. The Hide Manipulator Controls button lets you hide the bounding box and manipulator controls from the Camera view when an element is selected. Flips the current selection horizontally. You can also select Animation > Flip > Flip Horizontal from the top menu or press 4 or 5. Flips the current selection vertically. You can also select Animation > Flip > Flip Vertical from the top menu or press 4 or 5.